Shoulders are slightly hunched. The elbow is crooked. The eyes are focused on the wrist. And two fingers, usually the index finger and thumb, come together in a pinching motion. If you’re a runner who uses a tracking watch, chances are you’ll recognise this description. It’s the stance of most runners as they cross the finish line. Even though I’ve only run three official races, I’ve gone through enough pictures, kindly posted on social media by the photographers along the race routes, to have picked up on the trend. Everyone is tracking their own finishing times these days. And they’re also tracking their pace, heart rate, fastest splits, among others. I’m not judging though. I also study my data during and after a run – because I like to know how I’ve done in comparison to other runs. But these are not the only important numbers to know. Long before you hit the road, particularly if you’ve taken to running “later in life” like I did, there are some other stats you should check before you start, and continue monitoring during your training. 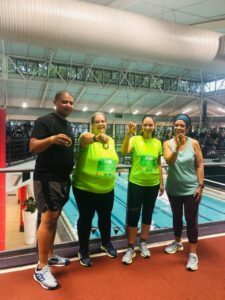 And that’s what we did on the first two days of our OptiFit programme as a group of ambitious runners started our training for the Old Mutual Two Oceans (Half) Marathon (OMTOM). On Day 1, we got off to an early start at the Sports Science Institute of South Africa where we had our height, weight, waist circumference, blood pressure, cholesterol and resting heart rate checked. Asked why this was important, biokineticist and OptiFit manager Nicola Johnston said on a very basic level, it’s important to know what your measurements are at the beginning and at the end so that we can measure improvements and changes. In addition to the data we recorded at that session, Nicola suggested that, before embarking on an intensive training programme, runners should also check for a family history of heart disease or other chronic conditions. It is also important to “take note of any medication and potential side effects – and the conditions that these medications are treating”. Increased blood pressure, cholesterol, family history – this could lead to increased risk for heart disease while “pushing” and increasing your fitness boundaries. Increased BMI and waist circumference (carrying extra weight) puts more pressure on your joints and can lead to injury. Strength training and “rehabilitation” type exercises are important to increase the stability of the joints and avoid this. But, I was also interested in the impact compulsive tracking could have on one’s running experience. While tracking can be very helpful because it “gives you continuous on-going feedback on your performance levels”, said Nicola, “unfortunately being ‘obsessed’ with these figures and over-analysing them can decrease the enjoyment factor, especially if you are not getting the numbers that you expect to be getting”. If you don’t have a small fortune to spend on a tracking device, and will be opting for a more affordable model, these are the basics your device should be able to measure. Time – you need to know how long you have been on your feet and if you are starting out running and walking, it is helpful to be able to time these splits. Distance – also very helpful and so that you have an idea of how far you are going in this time, especially if you are training for a race where there are cut off times. Heart rate – only if the watch measures this accurately of course – important for people that have heart disease risk factors. And then, on Day 2 we did one more test before we hit the road for our first group run. While this test “only” involved 12 minutes of running, it was incredibly challenging because for those 12 minutes we were really expected to give it our all – the aim of it being to cover as much distance as possible in the allotted amount of time.